I’m a big fan of soup any time of year, but there’s nothing like a light, brothy bowl of springtime veggies to take the chill off an early May evening. I tossed this together mostly from odds and ends: first, a lone leek which had been lingering in the crisper drawer, then some thinly sliced fennel stalks, both cooked with a sprinkling of salt and a knob of butter until soft. Next I added some cooked flageolet beans and their cooking liquid, plus a few additional cups of water, some sweet young carrots, and a half cup or so of carnaroli rice. While the broth bubbled and the rice plumped, I thawed some leftover cooked asparagus and peas from the freezer, adding them to the pot to just warm through. 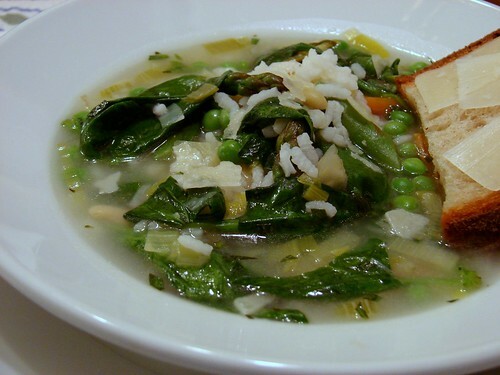 I tasted the soup for seasoning and added a few finishing touches, in the form of fresh spinach, chopped fresh tarragon, and shards of Pecorino Romano. A little toasted bread on the side (with more of that Pecorino), and we were good to go. that bowl would be perfect to bring me out of the funk this dreary, cool and misty day has put me in! I’m scared to make soup without broth/stock! Looks tasty though. melete – One thing I’ve learned is that leeks cooked in a bit of butter until soft, with water and salt added, turn into a really nice, light broth, which is great for soups like this. Give it a try!